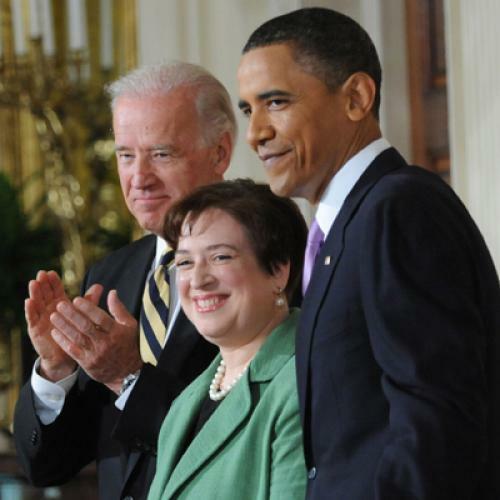 Why Kagan is the ideal Obama jurist. In a 1998 profile of Elena Kagan in the New Republic, Dana Milbank described Bill Clinton’s deputy chief of domestic policy as “wonderwonk,” an “all purpose brain” in the White House and a “nerd who could talk tough.” In addition to acting as a walking encyclopedia for Bill Clinton on constitutional and legal issues, Kagan convinced John McCain and other Senate Republicans to accept the Food and Drug Administration’s authority to regulate tobacco—even though she herself was a former smoker who then indulged in the occasional cigar. This combination of formidable intelligence with a skill for bringing together ideological opponents has characterized every stage of Kagan’s career. I first met Kagan in the mid-'90s when we were both former law clerks for Judge Abner Mikva on the U.S. Court of Appeals for the D.C. Circuit. Since then, I’ve run into her every few years, as she moved from the University of Chicago Law School to the Clinton administration back to Harvard, and most recently to the Solicitor General’s Office, where my brother-in-law is now her deputy. I've always been struck by her ability to ask a friendly but pointed question that identified the hardest issue in the legal dispute, to connect to the people she was questioning with an uncanny ability to see things from their intellectual perspective, and then to reframe the issue on her own terms so that the resolutions seemed clearer and more compelling. Obama has signaled that he wants a justice who can win Justice Anthony Kennedy to the liberal side of the Court in 5-4 votes. Given Kagan’s demonstrated success winning over skeptical conservatives at every stage of her career, she seems ideally suited for this role. On the Harvard Law Review, as a clerk for Justice Thurgood Marshall, and later as dean of Harvard Law School, she was liked and admired by people of widely different political perspectives. After her stint in the Clinton White House, where she was promoted from the White House counsel’s office to the Domestic Policy office because of her unique combination of legal ability and political skills, Kagan returned to Harvard Law as a professor and then dean. Her signal achievement was bringing together liberals and conservatives on faculty that was famously divided ideologically. Focusing on merits rather than ideology, she hired noted conservatives—such as Jack Goldsmith, the dissident Bush lawyer—ended public bickering, and convinced a formerly fractious faculty to vote unanimously on significant reform of the curriculum and grading system. It’s encouraging that Obama has ignored attacks on Kagan by enforcers of ideological purity on the left and the right, both of which caricature her essentially centrist record. The attacks from the right focus on her support, when she was dean of Harvard Law, for the misguided and unsuccessful law suit challenging the constitutionality of the Solomon Amendment, which denies federal funds to schools that barred military recruiters because of opposition to the gays in the military policy. The White House will try to rebut these attacks by offering testimony from conservative Harvard colleagues who argue convincingly that she is no Warren Court liberal. As for the attacks from the left, there are some who yearn for a return to Warren Court liberalism, where the courts imposed liberal policy views over the objection of the president and Congress. In addition to being politically impractical (we are unlikely to see a Supreme Court majority of Warren Court liberals in our lifetime), this strategy has also been rejected by President Obama, who recently criticized liberals for relying too much on courts to fight their battles for them in the 1960s, a strategy that he said ill prepared them for fighting conservative judicial activism today. Kagan is very much in the model embraced by Obama in his book The Audacity of Hope, where he observes that advances in our understanding of liberty and equality have always come primarily from grassroots political activism, and while courts can codify progressive values, they can’t impose them on an unwilling nation. In the great battles over progressive regulations that will occupy the court for the next decade, Kagan will be a compelling advocate for liberal judicial restraint, insisting that congress and the administrative agencies deserve deference, and criticizing conservatives who seek to use the courts to reverse their political defeats. It’s certainly fair for progressive senators to worry whether Kagan would move to the Court to the right. My sense is that this fear is misguided: While Kagan might be nominally to the right of Stevens in a few cases involving executive power, she is likely to be even more effective than he was in winning over Kennedy and more interested than he was for most of his career in challenging the conservatives on their own terms. For this reason, over the course of her career, she has the potential to be the intellectual leader of the liberals on the Court even more than Stevens, who always considered himself a judicial conservative. Some Senate Democrats have signaled, appropriately, that they think the Court needs an economic populist, and despite Kagan’s support for campaign finance reform as a Clinton official and solicitor general, she doesn’t have a track record of advocacy on economic issues. Kagan’s views about business issues—and the degree to which they were shaped by her experience running Harvard Law School—are worth exploring in her hearings. Nominees reveal their legal vision (or lack of vision) in hearings more than they know. In an academic article she will no doubt most regret, Kagan laid out what conservatives are already calling the “Kagan standard,” insisting that senators should question Supreme Court nominees closely. The Kagan standard is well worth applying to Elena Kagan, because her answers to the many legitimate questions about her views are likely to demonstrate her intellectual security, ability to empathize with and win over her ideological opponents, insistence on clarity, judicial temperament, and political skill. In Kagan, Obama has a Supreme Court nominee who has the potential to carry his own constitutional vision of progressive judicial restraint far into the twenty-first century. Jeffrey Rosen is the legal affairs editor of The New Republic and author of The Most Democratic Branch: How the Courts Serve America.